Definition at line 33 of file CQEventDM.h. Definition at line 21 of file CQEventDM.cpp. Definition at line 31 of file CQEventDM.cpp. Definition at line 47 of file CQEventDM.cpp. References CCopasiVector< T >::begin(), COL_ASSIGNEXPRESSION_EVENTS, COL_ASSIGNTARGET_EVENTS, COL_DELAY_EXPRESSION_EVENTS, COL_DELAYED_EVENTS, COL_NAME_EVENTS, COL_ROW_NUMBER, COL_TRIGGER_EVENTS, CCopasiVector< T >::end(), flags(), FROM_UTF8, CKeyFactory::get(), CEvent::getAssignments(), CCopasiRootContainer::getDatamodelList(), CEvent::getDelayAssignment(), CEvent::getDelayExpression(), CEvent::getDelayExpressionPtr(), CExpression::getDisplayString(), CCopasiRootContainer::getKeyFactory(), CCopasiObject::getObjectDisplayName(), CCopasiObject::getObjectName(), CEvent::getTriggerExpression(), CEvent::getTriggerExpressionPtr(), CQBaseDataModel::isDefaultRow(), and rowCount(). Definition at line 36 of file CQEventDM.cpp. Definition at line 158 of file CQEventDM.cpp. References COL_ASSIGNEXPRESSION_EVENTS, COL_ASSIGNTARGET_EVENTS, COL_DELAY_EXPRESSION_EVENTS, COL_DELAYED_EVENTS, COL_NAME_EVENTS, COL_ROW_NUMBER, and COL_TRIGGER_EVENTS. Definition at line 228 of file CQEventDM.cpp. References ListViews::ADD, COL_NAME_EVENTS, CQBaseDataModel::createNewName(), ListViews::EVENT, CCopasiRootContainer::getDatamodelList(), CEvent::getKey(), CQBaseDataModel::notifyGUI(), and TO_UTF8. Definition at line 277 of file CQEventDM.cpp. References C_INVALID_INDEX, CQMessageBox::confirmDelete(), FROM_UTF8, CCopasiRootContainer::getDatamodelList(), CModel::getEvents(), CCopasiDataModel::getModel(), CCopasiObject::getObjectName(), CQBaseDataModel::isDefaultRow(), and CQBaseDataModel::removeRow(). Definition at line 244 of file CQEventDM.cpp. 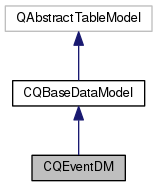 References CCopasiVector< T >::begin(), ListViews::DELETE, ListViews::EVENT, CCopasiRootContainer::getDatamodelList(), CModel::getEvents(), and CQBaseDataModel::notifyGUI(). Definition at line 27 of file CQEventDM.cpp. Referenced by data(), and CQEventsWidget::deleteSelectedEvents(). Definition at line 197 of file CQEventDM.cpp. References ListViews::CHANGE, COL_NAME_EVENTS, CQBaseDataModel::createNewName(), data(), ListViews::EVENT, CCopasiRootContainer::getDatamodelList(), CEvent::getKey(), CQBaseDataModel::insertRow(), CQBaseDataModel::isDefaultRow(), CQBaseDataModel::notifyGUI(), CCopasiObject::setObjectName(), and TO_UTF8.